Gun stocks are one of the places that stone inlay's ability to be beautiful and functional at the same time really shines. The stone is sanded flush with the wood and the stock and inlay are sealed together, producing durable art that is able to stand up to use in the field or on the range. Using stocks as a "canvas" for stone inlay art is not without it's challenges, however. 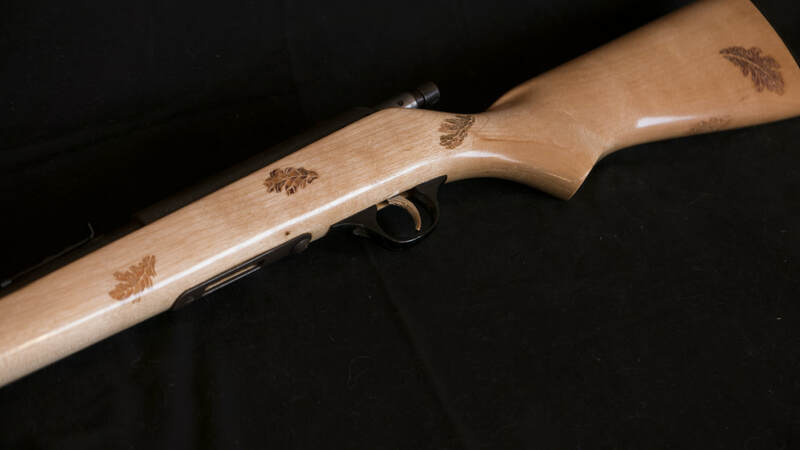 Many of the curves and dimensions need to be kept within specific parameters to make the stock safe and comfortable to use, and older guns may have damage that needs repair or the inlay needs to cover. 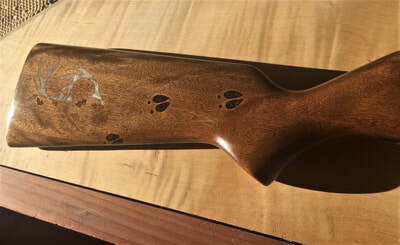 But it's worth it to make an old gun that someone loves not just usable, but beautiful again. 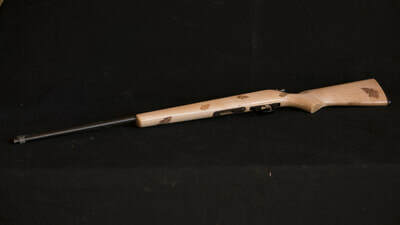 This bolt action .22 was going to be the first gun for a little girl - but needed a major stock overhaul. The sling stud holes were stripped out to the point of being unusable and it looked like someone had allowed an over energetic beaver to try and "shape" some parts of it. 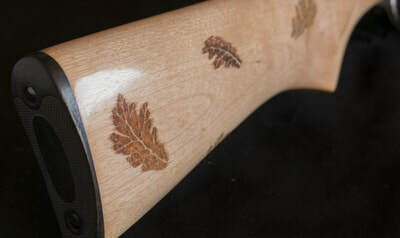 I reshaped the entire stock and then inlaid it with tumbling oak leaf design that would allow the leaves to cover the old, non functional sling stud holes. It's finished with multiple coats of Tru Oil. The oak leaves are made of granite, jasper, sandstone and calcite. This is a replacement stock for a bolt action .30-30. 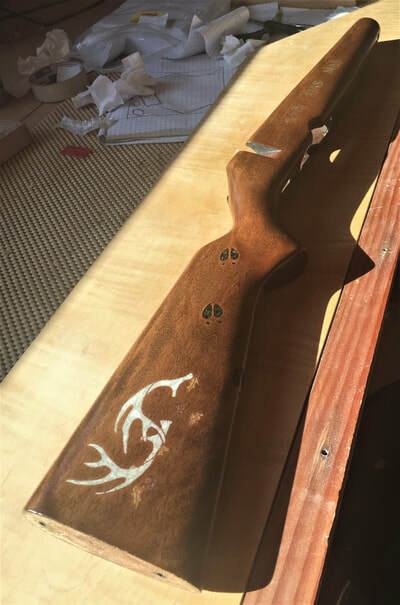 The original stock was no longer usable but the gun had sentimental value and the owner wanted to return it to usable while honoring some of it's history. 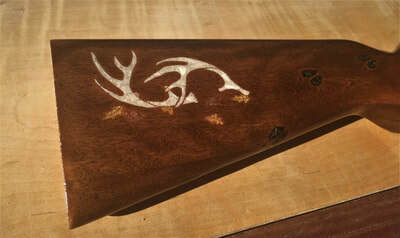 Since it had been a family deer rifle I inlaid it with antlers made out of actual deer antler laying on a bed of calcite, and jasper oak leaves. There are biotite and obsidian deer tracks that wrap around the rifle and malachite and sodalite family initials on the fore end.